2015-05-06: Publication of advices when buying a house in Spain in the British online guide of Worldfirst. 2014-09-29: Article in Dutch online magazine Grenzenloos about the necessity to hire a lawyer when buying a Spanish property (page 11, Dutch). 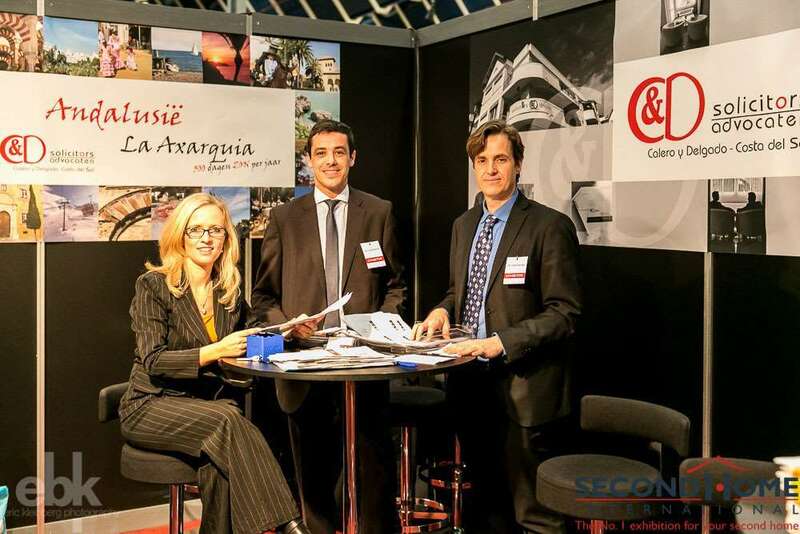 2014-03-28: C&D was present at the Dutch Second Home Fair in Utrecht with a stand and a daily well-attended seminar about the Spanish purchase process. 2014-02-04: Gustavo Calero during a Partido Popular conference in Sevilla concerning ´Solutions for the 300.000 families with illegal houses´. 2014-02-01: Publication of article in Dutch Emigreer magazine ´The buying of a house on the Spanish countryside´ (page 10, Dutch). 2013-11-20: Publication on the Spanish legal website Legal Today ´The demolition of houses on non-developable land in Almeria´ (Spanish). 2013-11-01: Dutch publication in Kosta magazine ´The buying of a house on the Spanish countryside´ (p32, Dutch). 2013-08-27: Publication on the Spanish legal website Legal Today ´Important judgement in Spain for home buyers that bought from a developer without bank guarantee´ (Spanish). 2013-04-12: Publication on the Spanish legal website Legal Today ´The invalidity of Spanish building permits: concerned holders and third parties in good faith´. 2013-02-05: Publication on the legal blog of the Bar Association of Malaga (ICAM) ´New obligations for fiscal residents in Spain´. 2013-01-29: Publication on the legal blog of the Bar Association of Malaga (ICAM) ´Legal advice: how cheap can be expensive´. 2012-12-18: Publication on the Spanish legal website Legal Today concerning ´The recent fires on the Costa del Sol and their effect on houses on non-developable land´. 2012-11-28: In collaboration with the Town Council of Frigiliana, a lecture to explain the difference between resident and non-resident taxation focusing on Inheritance Tax and capital gains. 2012-09-20: Lecture about different tax matters with our friends from U3A (University of Third Age) at their annual meeting. 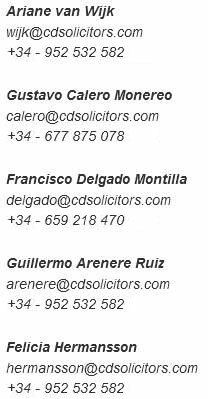 I accept the terms and conditions I would like to stay informed about Spanish legal news and taxes through the newsletter of C&D Solicitors (max. 1x per month).